I have been running for about 5 years. I have completed a bunch of half marathons, several marathons, and now I am on to triathlons. But when it comes to running I have stayed on the road. The road is predictable. The road is flat. I find the road to be safe. I have tried the trails a little. Many talk about preferring running trails because it is a softer surface a nd more forgiving than the pavement. I have said that I prefer the predictable nature of pavement over the ankle turning nature of trails. Enter Stuart (@Quadrathon). I was lucky enough to find Stuart through some combination of Twitter and the Dailymile and Foursquare (not sure which one first). We connected via the interwebs but we actually live quite close. We had been saying for some time that we should run together and this past week we finally made it happen. We did a couple early morning runs around town which were great. I am always happy to find someone to run early in the morning. So then he proposed some trail running this weekend. Something I am not strong at. Lately I have seen a lot of improvement in my running with regards to pace. The thought of running on trails meant I would see a decrease in my speed for sure. But I knew that this might be the time to branch out my running style. I was hoping that running in a new environment would translate to better running overall. So this morning we set off to an open space near by, Chesboro Canyon. The weather was kind of gloomy. Very foggy and practically drizzling. It had rained a lot this winter so there is a lot of fresh growth in the canyon. We set off for 10 miles as I laughed at my choice of socks, bright white knee-high compression socks (not the best idea with the current conditions). The running was awesome! 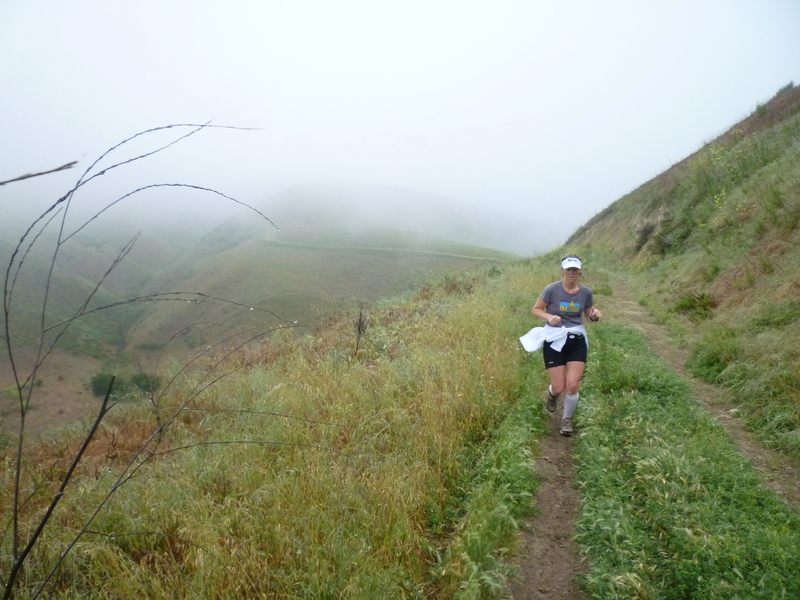 Now that I am a stronger runner I was so much more comfortable with the quick changes in elevation and surface type. It was so nice to be away form the cars, and roads. The combination of terrain and company made for a great run. I ran significantly slower than usual and had to do some walking up some of the hills (favorite quote of the day, “it gets worse after this!”). But overall I was pleased with how I did. Possibly to Stuart’s dismay I was able to hold a conversation for most (if not all) of the run. I may have been muddy, and wet, and cold by the end but the increase in confidence I felt left me beaming! I can’t say how thankful I am that Stuart helped get me out of my running rut and on to the trails. Training can get tedious, repetitive, and boring if you never change things up. I needed a little nudge to move me on to something new. 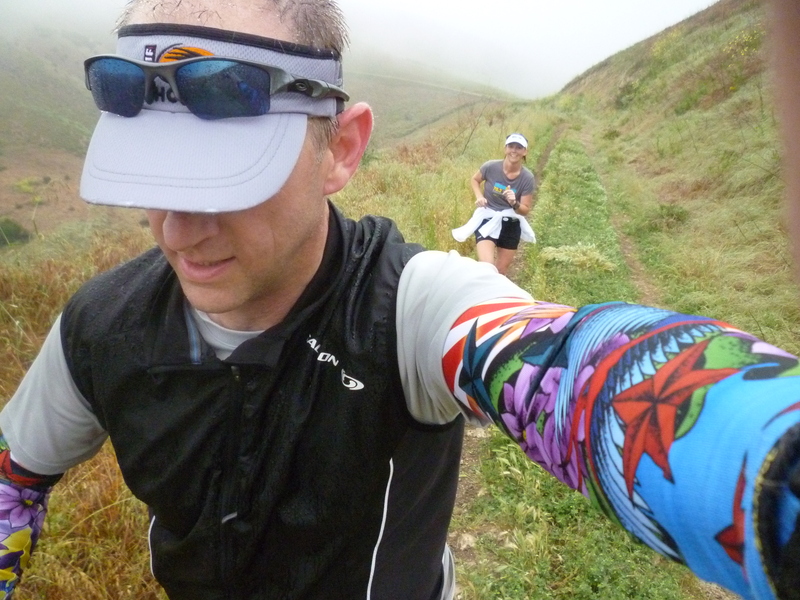 I am already looking for my first trail half marathon… ready to run Boney Mountain with me Stuart? Garmin Details for the run. Awesome Becca!! I enjoy reading about your runs. I bet the trails bring a lot of beauty to your runs as well. It is just cool seeing someone enjoy something as much as you do, someone passionate about something. Thanks for being inspirational. Thanks for the super kind words. I am so excited to start using a blog to show my enthusiasm for my training! Thank goodness there are people like you to read it! Great run! I rarely run with a partner, but I agree, it’s run when I do! That was my biggest fear. I think as I get a little bit stronger in my ankles that will happen less and less. I intentionally did not carry a water bottle so I could catch myself when I fell! I have fallen more on pavement than trail! Great work out there Sunday! Handhelds actually will help, they will save your hands taking a tumble is almost guaranteed! I was worried they would give me a problem when I fall! And, let’s face it, I’m gonna fall at some point…. BUNNY! !